Is endurantism really more plausible than perdurantism from a common-sense perspective? I will discuss three arguments in favor of perdurantism, the thesis that objects persist by having temporal parts located at different times. Firstly, I will introduce the rival accounts of persistence of perdurantism and endurantism. Then I will discuss three arguments for perdurantism: the problem of temporary intrinsics, the argument from vagueness and the argument from Special Relativity. I will conclude that none of them represents a knock-down argument for perdurantism. However, endurantism faces important difficulties in offering its solutions to the issues at stake, and the solutions proposed are often at odds with commonsense. Therefore, if one of the main problem for perdurantism is its being at odds with commonsense, endurantism is in no better position with respect to this issue. Estudiante de doctorado en la Universidad de Duisburg-Essen y ex investigador visitante en la Universidad ICESI de Cali. Maestría en filosofía analítica de la Universidad de Barcelona. Maestría en Ciencias Cognitivas y Lenguaje de la Universidad de Barcelona. 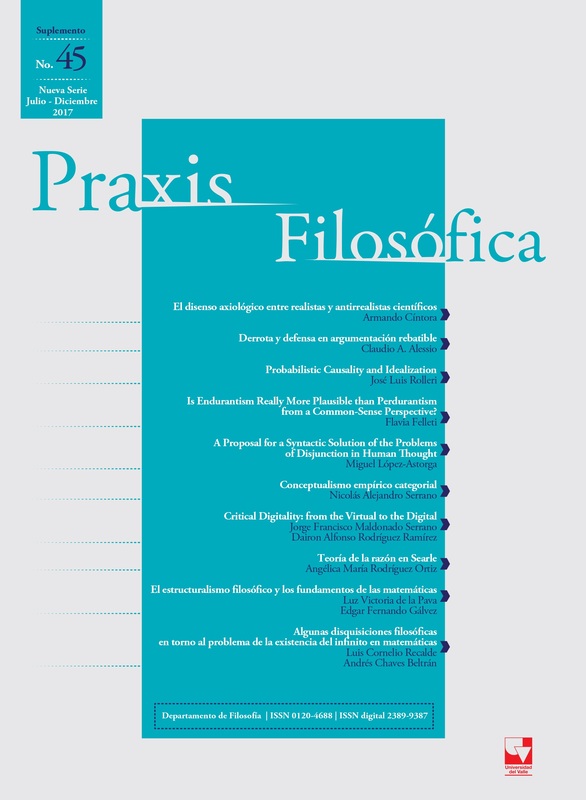 Sus publicaciones recientes incluyen “What autism can tell us about the relationship between empathy and moral reasoning?” en Phenomenology and Mind y (2016) “The Rule of Accommodation for Presuppositions in Lewis’ Language Game” en Dialogue. Ha presentado recientemente las ponencias “¿Autismo, que puede decirnos acerca de la relación entre la empatía y el razonamiento moral?” En el VI Congreso colombiano de filosofía (Barranquilla) y “What Autism can tell us about the Relationship between Empathy and Moral Reasoning?” En las conferencias Frontiers in Neuroethics en Padua (Italia) y Emotions, Normativity, and Social Life en Milán (Italia). Sus áreas de interés son la filosofía de la mente y las ciencias cognitivas, la metafísica y la filosofía del lenguaje. Brogaard, B. (2000). ‘Presentist Four-Dimensionalism’, Monist. 83, 341–56. Dorato, M. (2013). Che cos’è il tempo? Einstein, Gödel e l’esperienza comune. Carocci Editore. Chapters 2-3. Heller, M. (1984). ‘Temporal Parts of Four-Dimensional Objects’. Philosophical Studies. 46, 323–334. Jackson, F. (1998). ‘Metaphysics by possible cases’. In Mind, Method, and Conditionals. London: Routledge. Lewis, D., K. (1986). On the Plurality of Worlds. Oxford: Blackwell. Chapter 4. Loux, M., J. (1998). Metaphysics: A Contemporary Introduction, London: Routledge. Chapter 8. Markosian, N. (2004). ‘A defense of Presentism’. In Zimmerman, Dean W. (ed.) Oxford Studies in Metaphysics. 1, 47-82. Merricks, T. (1999). ‘Persistence, Parts and Presentism’, Noûs. 33, 421–38. Meyer, u. (2005). ‘The Presentist’s dilemma’, Philosophical Studies. 122, 213-225. Parsons, J. (2000). ‘Must a Four-Dimensionalist Believe in Temporal Parts?’, Monist. 83, 399–418. Putnam, H. (1967): ‘Time and Physical Geometry’, Journal of Philosophy. 64, 240-247. Saunders, S. (2002). ‘How Relativity Contradicts Presentism’, in C. Callender (ed. ), Time, Reality & Experience, Vol. 50 of Royal Institute of Philosophy Supplement (pp. 277-292), Cambridge: Cambridge University. Savitt, S. (2000). ‘There’s No Time Like the Present (in Minkowski Spacetime)’, in D. Howard (ed. ), PSA98, Part II: Symposia Papers (pp. S563-S574), East Lansing: Philosophy of Science Association. Shoemaker, S. (1969). ‘Time Without Change’. The Journal of Philosophy. 66 (12), 363-381. Sider, T. (1997). ‘Four-Dimensionalism’, Philosophical Review, 106: 197–231. Sider, T. (2001). Four-Dimensionalism, Oxford: Oxford University Press. Sider, T. (2008). ‘Temporal Parts’, in Contemporary Debates in Metaphysics, edited by Hawthorne, Sider and Zimmerman, Oxford: Blackwell, 241–62. Sklar, L. (1981). ‘Time, Reality, and Relativity’, in R. Healy (ed. ), Reduction, Time, and Reality (pp. 129-142), Cambridge: Chicago University Press. Thomson, J., J. (1983). ‘Parthood and Identity Across Time’, Journal of Philosophy, 80: 201–20. Van Inwagen, P. (1981). ‘The Doctrine of Arbitrary Undetached Parts’, Pacific Philosophical Quarterly, 62: 123–137. Varzi, A. (2005). ‘Change, Temporal Parts, and the Argument from Vagueness’. Dialectica. 59 (4), 485–498. Weingard, R. (1972). ‘Relativity and the Reality of Past and Future Events’, British Journal for the Philosophy of Science 23: 119-121. William Godfrey-Smith (1979). ‘Special Relativity and the Present’. Philosophical Studies: An International Journal for Philosophy in the Analytic Tradition. 36 (3) (Oct., 1979), 233-244.